If you have any known health issues, I suggest you stop reading here. This is bad for your heart, your cholesterol, your weight, and probably your bones and even your ears. Other than the magnificent taste, I'm pretty sure there is not a single redeeming thing about this dish nutritionally. But I also think this is something you have to make once in your life. If you ever find yourself on death row, it would make a great last meal. I'd die with a smile on my face if this were my last meal. Adapted from AllRecipes. A warning to your heart: I didn't make any changes to the flavors. I just added more bacon. My motivation? I didn't want to leave a partially used pack of in the fridge because I have a real hard time coming back to things. You will be cooking this for about an hour on 375. Preheat your oven and prep a loaf pan before doing the other steps. 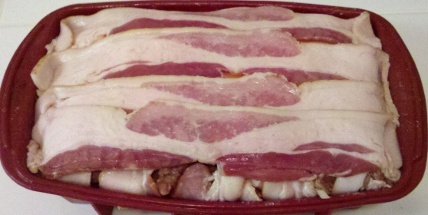 To prepare your loaf pan, add 6-8 strips of bacon width wise to cover the bottom of the pan. 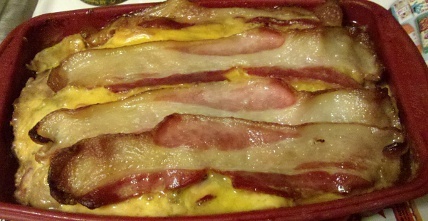 No need to worry about greasing the pan, the bacon will do the work for you! Combine the beef, eggs, and ketchup in a large bowl. 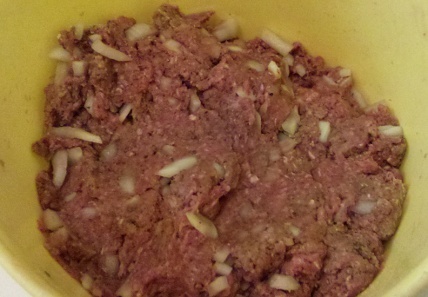 Since this is meatloaf, I find it easiest to mix everything with my hands. If you can handle the mess, I'd recommend you do the same. After it is well mixed, add everything through the onion and mix some more. Place half of the meat mixture on top of the bacon. Top that portion with half of the sliced cheese. Place the remaining beef mixture on top of that cheese. Place the remaining cheese on top of that. Wrap the handing bacon parts from the pieces on the bottom of the pan over the loaf. 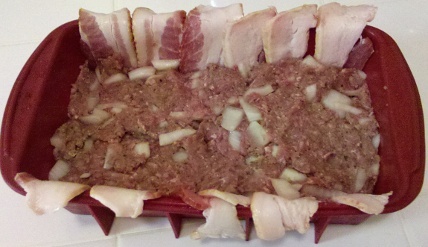 Use the remaining bacon strips from the package by placing them length wise over your meatloaf, so that the whole thing is covered in bacon. You're done, all that's left is to cook it.